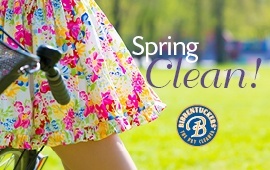 Dry Cleaning Symbols and Garment Care Labels – What Do They Mean? The first things you look for on a dress or blouse that you like is the care label. Can you drop it off at the dry cleaners to have it cleaned, or can you toss it in the washer at home? When it comes to shopping for clothing, garment care labels influence purchasing decisions. Whatever your preference, properly caring for clothing based on the manufacturer’s instructions ensures that garments look better and last longer. This will save you time and money. The Federal Trade Commission (FTC) Care Labeling Rule requires clothing manufacturers and importers to provide regular care instructions through the use of care labels. These care instructions divide into six basic categories. They are washing, bleaching, drying, ironing, dry cleaning, and warnings. 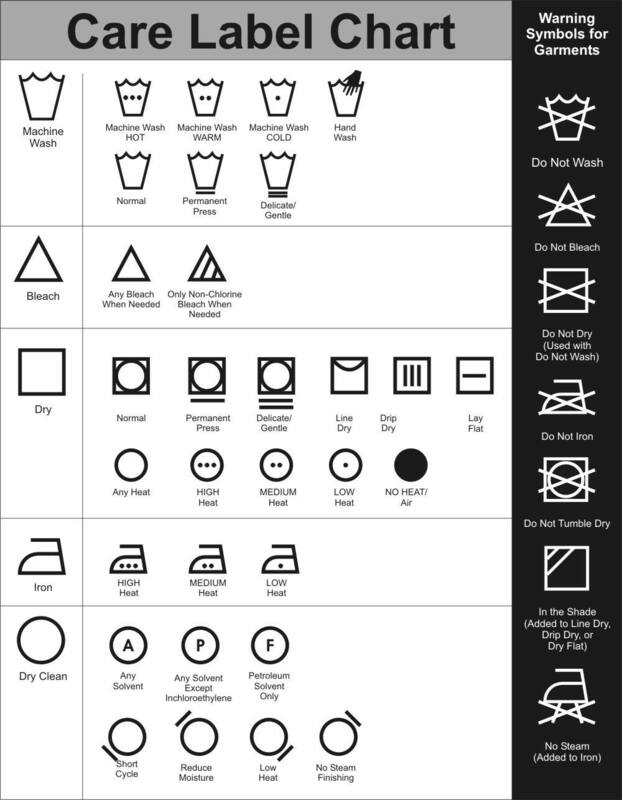 Instructions can be spelled out, as in “Machine wash & Tumble dry.” Many manufacturers use graphic symbols in addition to the written instructions — a kind of shorthand for care techniques. The symbols and standards used here in the United States vary from those used in Europe and other countries. The water temperature specified on the care label is the maximum recommended temperature. If the label recommends hot water, you may use cold or medium temperatures with no concern. If the label does not mention bleach, you may use commercially available bleaches without harming the garment. Unless regular use of high temperatures will harm a garment when dried, a label does not need to specify a temperature setting. A label must specify a temperature setting for ironing when a hot iron will harm a garment. The warnings on care labels are for real. If you use a cleaning procedure that would harm a garment – like touching it up with an iron – then the label will contain a warning like “Do not,” “No,” or “Only,” to warn against the harmful procedure. “Dry clean only” means just that – machine washing will damage the garment. “Professionally dry clean” means that a modified dry cleaning process must safely dry clean the garment – for instance by the use of a certain solvent, reduction in cleaning time, the addition or elimination of steam in pressing the garment, etc. Finally, for the protection of your garment, follow the instructions and take it to your preferred dry cleaner for professional care.